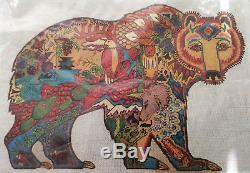 For your consideration is a new hand painted needlepoint canvas - Grizzly Bear. Designer: Danji (Earth Art International, Sue Coccia), # EA01. 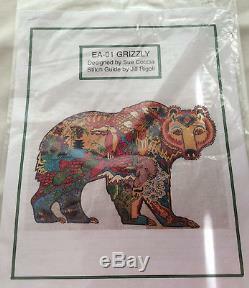 Includes stitch guide by Jill Rigoli. 18.5" x 14.5" and the painted design area measures approx. Edges will be taped for your convenience. Canvas and stitch guide only. I have more Danji for sale separately! Then use the Request Total button for a revised invoice. Otherwise, please wait for a revised invoice. Thank you for your business! 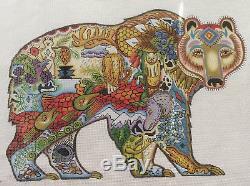 The item "Handpainted Needlepoint Canvas Grizzly Bear & Guide Danji Earth Art Intl EA-01" is in sale since Sunday, August 5, 2018. This item is in the category "Crafts\Needlecrafts & Yarn\Embroidery & Cross Stitch\Hand Embroidery Cloth & Canvas\Plastic Canvas". The seller is "victori-anne" and is located in Wylie, Texas. Design Size: approx. 14" x 10"